When some friends and I stayed in a ski shelter last November, the fireplace needed to be restocked with wood every hour to stay comfortable. The slough outside was entirely frozen over. The icy wind rumbled the plastic windows. The frost-covered trees seemed so stiff and brittle, they could shatter like glass. Something has changed this year. Call the culprit whatever you like (I like the hyped up 'Super El Niño'), but we've been given a new season to deal with. It's a sort of limbo between winter and fall. I shall call it 'slautumn' – a word that embodies the sleet and slush, doom and gloom, and downright disorientation from still being able to fish open water. The picnic shelter at Batka Lake, looking particularly murder-y today. Jean-Paul, questioning a swim in Little Boggy Creek. A drive down Ski Hill Road takes Sean, Jean-Paul and I back to Batka Lake where we pull up to an empty parking area. We haven't seen a soul for miles— the main perk for this time of year. I step outside and breathe in the scent of old leaves and pungent spruce. I'm not sure why my stomach twists considering this is going to be, quite literally, a walk in the park. Leaving for Moose Lake on the Duck Mountain cross-country ski trails. Last winter's failed attempt to reach Moose Lake comes to mind. The bad omens weighed far too heavily against us. We ended up having to give up and go home. No reason to weasel my way out of this one. Besides, this hike is only a little over 5 km on groomed trail, and, it's not -40 outside. The windless atmosphere does make the dead-looking forest feel like the perfect setting for a horror movie though. With that in mind, we decide to focus our shots on capturing the lonely and dismal atmosphere. Jean-Paul inspecting a 'dismal' mushroom. Even when trying to capture the loneliness of it all, I feel like my shots are coming out a little too vibrant and cutesy. It doesn't help that Jean-Paul keeps running into frame gleefully smiling. Sean however, being the reclusive type, is a natural master of doom and gloom. The change from our other trips this year is actually refreshing. Sometimes ugly is prettier than sunshine and rainbows. We continue our march. Over a few more slopes, Moose Lake Shelter peeks its head. Welcome to hell... Er, Moose Lake. Eager to see how Moose Lake squares up to Ski Hill Shelter, I make myself at home. It's a decent establishment. Not quite as cozy, but all the amenities are there plus a homemade acoustic guitar. This is convenient since there's not much else to do. The white vinyl interior makes the shack feel more like a beach house than a cabin in the woods. It's almost an identical setup to Ski Hill Shelter, with furnace, axe, frying pans and even a solar-powered interior light. There's no pressure to chop firewood or get cooking before dark. So, we take this cue to procrastinate and enjoy the sweet boredom. Shadows leaving a 'black-and-white' effect on the lake. 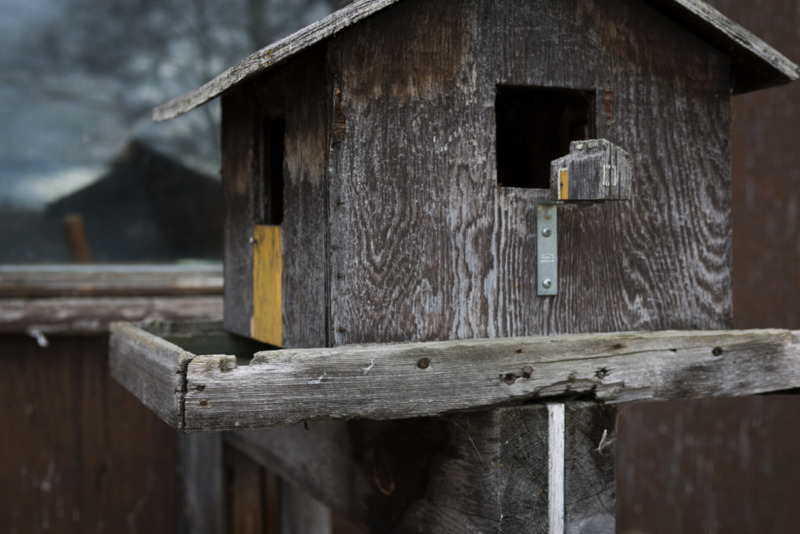 Someone went through the trouble to build a Moose Lake Shelter replica birdhouse. I don't want to over-romanticize what is, quite honestly, a slack adventure. But there's something to be said about simplicity. When wilderness backpacking, your mind gets preoccupied with the hike, or building camp. Out here at Moose Lake, there's time to stretch out and enjoy the area for what it is. Pure, quiet nothingness. The sound of cracking beers and a crackling fire breaks the silence, along with a chorus of howling wolves in the distance. Home decor or satanic shrine? With beer supplies running low around midnight, it's time to turn in. I decide to sleep up in the loft, which is a huge mistake since I'll be slow-cooked by the furnace. But I'm happy to let the fire die while I toss and turn on the stiff 1960s couch cushions that make up my mattress. The only perk from a terrible night's sleep is waking up to see the sunrise from the loft. Sunrise over Moose Lake from the shelter's loft. I turn back and try to keep the sun out of my eyes. I need to rest off this headache, caused by some wicked combination of alcohol and cheese, breathing carbon monoxide all night and sleeping on a wooden plank. The dingy cushions are not doing me any favours. By noon, I have recovered the bare minimum of my consciousness and dignity to make the hike home. Fresh air is the ultimate hangover cure. And, as luck would have it, we find ourselves hiking through sunshine and rainbows all the way home.